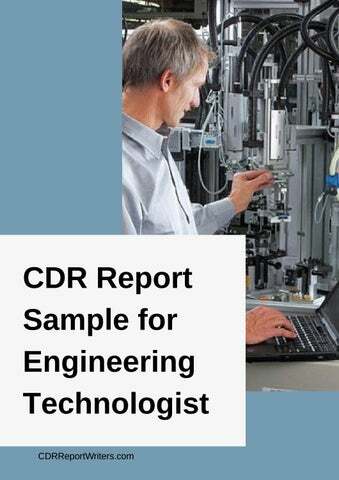 CDR Report Sample for Engineering Professionals (nec) Curriculum Vitae (CV): Resume on the basis of a professional template. Continuing Professional Development (CPD): The sample of CPD clarifies the Engineering Knowledge of the applicant – 350 words. Engineering Technologist Career Episode Sample 1: “Performance Investigation of Network in Disaster Relief Operations” -1915 words Engineering Technologist Career Episode Sample 2: “Wireless Network Security Improvement”-2130 words Engineering Technologist Career Episode Sample 3: “Resolution Improvement of Novel Satellite image”- 2300 words Summary Statement Sample: Detailed explanation of all the competency element – 2000 words. Engineering Technologist Career Episode Sample 3 Project Name: Resolution Improvement of Novel Satellite image In third career episode the writer talks about the details of the project that he had accomplished during advanced diploma. The title of the project was: â&#x20AC;&#x153;Resolution Improvement of Novel Satellite imageâ&#x20AC;? and his responsibilities were: To perform the literature survey to obtain the required information for the initiation of the project. To design methodology to drive the project serially. To propose a technique to enhance the resolution of the image To perform calculation related to quality of the image. To simulate the image to obtain the result in MATLAB. To finalize the project by comparing the result to the theoretical data and make report on it.